You have to take a boat from Panama City to get there (30 mins). We took the Taboga Express which leaves four times a day. You can find the current time table on the company’s website. I liked the island because it was relaxed and not crowded and its perfect for a daytrip. On weekends, the island is more crowded with locals visiting from the city. Boat Ticket: 20 USD. 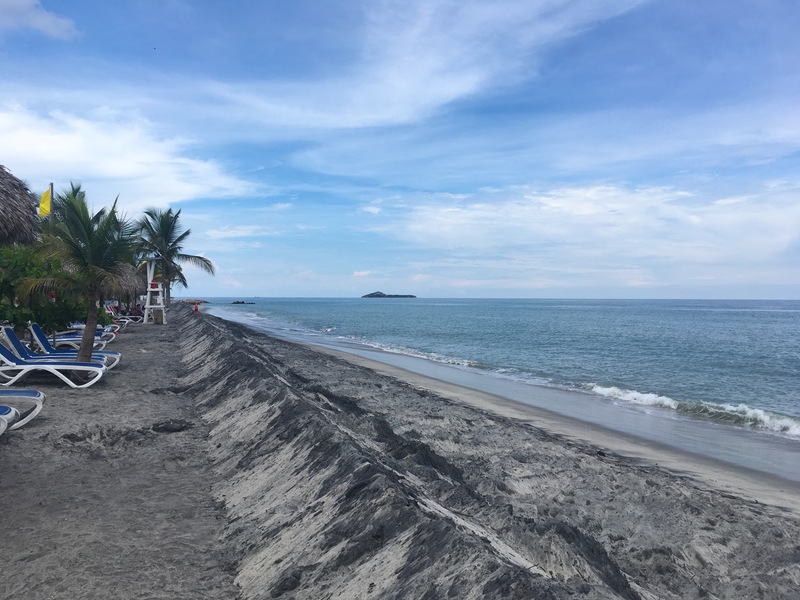 On the Pacific Coast of Panama there are beaches with black sand mixed with typical beige / brown sand. The mix of these sand colors makes beautiful patterns that change when the sand is dry or wet. The special thing about this black sand is that its glittering when the sun or the moon is shining on it. I really loved it and think it looks absolutely beautiful! After approx. 1,5 hours by car from Panama City you reach San Carlos. We stayed in this town because it’s a good starting point to explore the coast and it’s cheaper than other beach areas. Only 20 minutes farther, you can find the next beach area Santa Clara, followed by El Farallon and Playa Blanca. San Carlos is a nice, quiet town, surrounded by various beaches. There are houses to rent on Airbnb and Surf hostels. We stay in San Carlos Beach Inn and really liked the friendly hosts and nice rooms. The unpopular beaches are not marked, not easy to find and access but if you are lucky, you may have the whole beach for yourself! We found one amazing beach, that we only had to share with two local families. Don’t forget to bring your own drinks and snacks because on lonely beaches you can’t find any bars or shops. Santa Clara is a small beach town with traditional colorful houses. 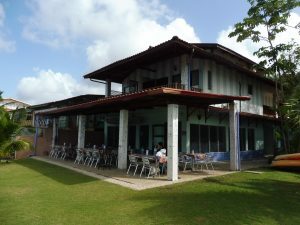 At the end of the beach you can find a very nice bar directly on the beach which is selling local dishes and drinks. The atmosphere is very relaxed, with Latin music playing and locals enjoying the time with their friends and family. The only tourists there were mainly backpackers, hippies and surfers. I liked this beach because it’s not as busy and exclusive as Playa Farallón and Playa Blanca. 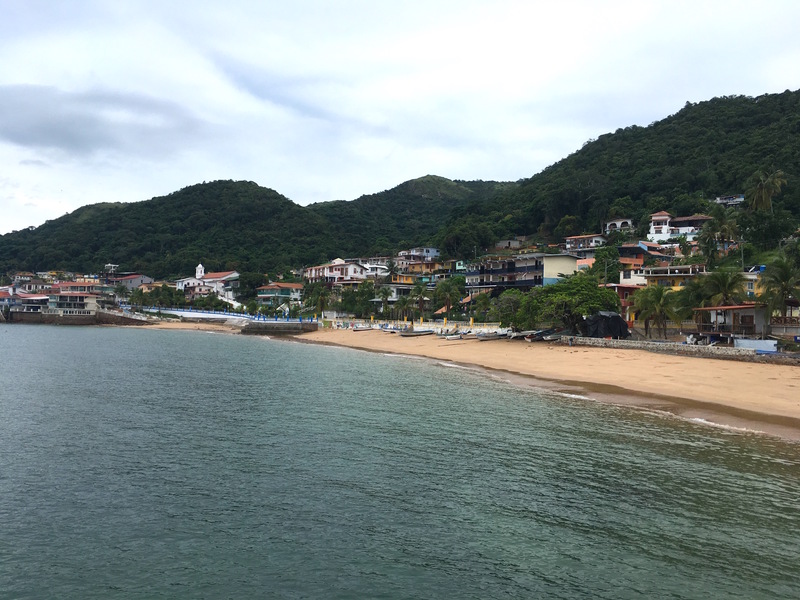 Farallón is a fishing community located on the coast. The locals have to share this stretch of the coast with several luxury and all-inclusive hotels. This is why staying in this area can be very expensive. This beach is only accessible through hotels and resorts. 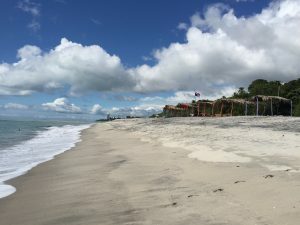 We stayed for one night at the Playa Blanca Beach Resort – All-inclusive for 75 USD each person. It’s not my favorite kind of accommodation, but it’s nice for a weekend and the price is fair. Even alcohol is included, so it’s fun to go there with your friends. 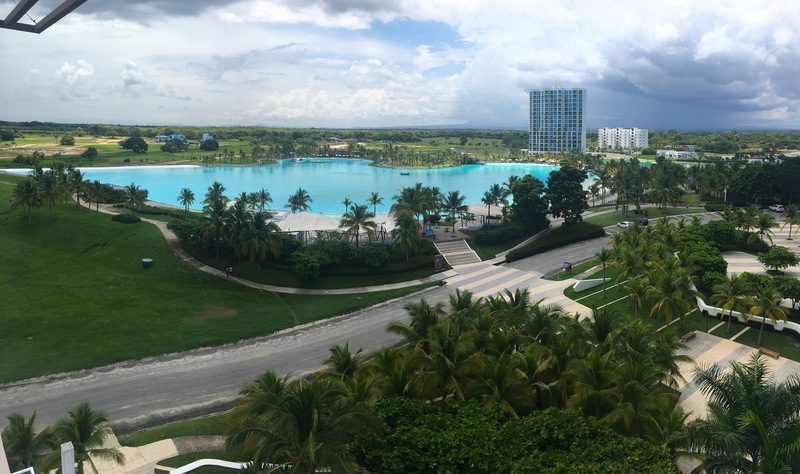 There is also the biggest pool I have ever seen, even boats are driving on it. Only residents of the neighboring complex are allowed to use it, but you can go there and have a look at this never ending pool. Portobelo is laid-back fishing village in the district of Colón, approx. 1,5 hours by car from Panama City. It’s hard to imagine that this tiny town was once the greatest Spanish port in Central America. 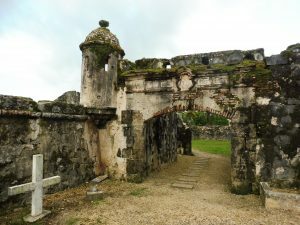 The colonial fortresses, built in the 17th century, are still standing there and local houses are built among the ruins. We stayed at Casa Congo, which is a guesthouse with really nice rooms, directly on the ocean. Our room was on the first floor and we had a nice terrace where we could enjoy the view while chilling in the hammock. Part of the guesthouse is the Congo House Gallery & Workshop, a gallery for the artisans of the community. They have paintings, sculptures, furniture and other local handicrafts presenting the local culture. 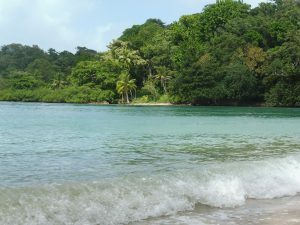 There are a few islands around the area of Portobelo, the most famous one is the Isla Grande. Our guesthouse was offering boat trips to the islands. 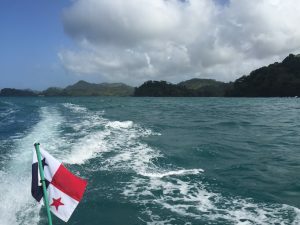 I don’t remember the name of the island we chose, but it was a 20 minutes’ boat ride from Portobelo. I was amazed by the jungle scenery in this area, with tiny beaches popping up between untouched nature. Unfortunately, even on this small, not-touristy beach there was trash that people left behind, so please remember to take your trash back to the main land. 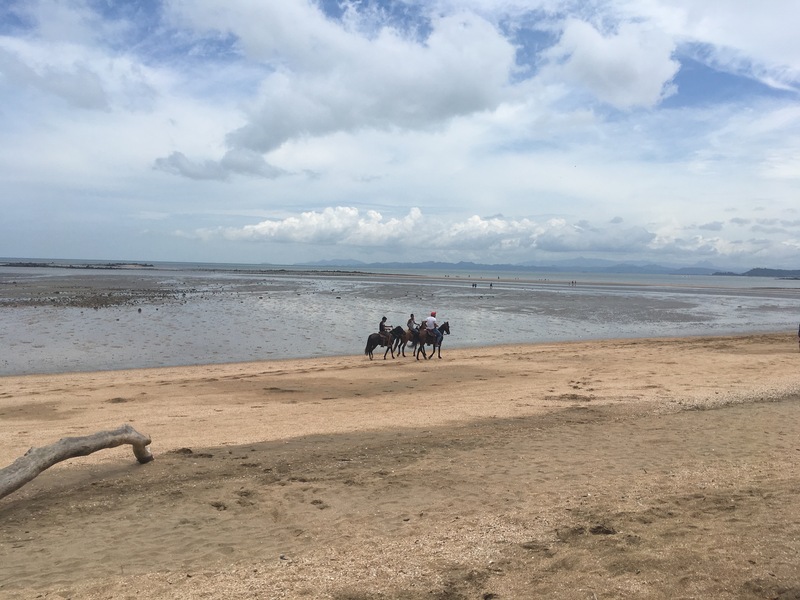 I liked this trip and visiting this untouched beach and I think it’ a nice and relaxed alternative to the busier Isla Grande. 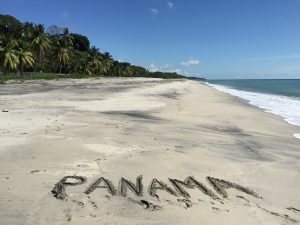 Panama’s paradise with over 360 islands. For me this was the most beautiful place in Panama! You can find more information about this paradise in my blog about San Blas.